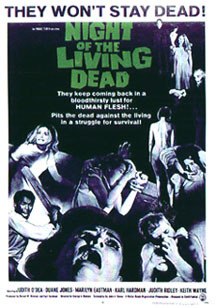 To be sure, zombie movies had been around long before Night of the Living Dead. Among the early films involving the dead coming back to life were White Zombie (1932), The Walking Dead (1936) and I Walked With a Zombie (1945). It took an ambitious young filmmaker from Pittsburgh, Pennsylvania named George Romero to fully bring the subject into the public consciousness. Along with PSYCHO, Night of the Living Dead must surely rank as one of the most influential horror films of the 60s. Its bleak depiction of dread and isolation, along with the uncompromising gore, make this an unforgettable classic. Romero produced the project with his company Latent Image, in conjunction with an advertising company called Hardman Associates. A man of all trades, he also did the cinematography, editing, and co-wrote the screenplay with his friend John A. Russo. 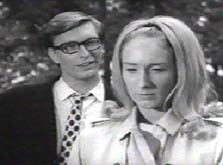 Barbara (Judith O'Dea) and Johnny (Russell Streiner) are visiting a cemetery to lay a wreath at their father's grave. It's still daytime on this early Spring evening...and a storm is headed their way. The two are not alone. In the distance, a pale-faced stranger (played by Bill Heinzman) lurks among the burial plots. Johnny teases his sister about how she hates going to these places and taunts her by saying, "They're coming to get you, Barbara!" He adds, "Look...there's one of them now," and points to the stranger. Barbara starts to walk away and bumps right into the ghoul, who then grabs her. She screams and Johnny tries to help her. The two men struggle and Johnny falls to the ground, his head slamming on one of the tombstones. The ghoul comes after Barbara and she runs to her car, losing a shoe in the process. She doesn't have the key to start the engine and can only lock the doors. Her pursuer knocks at the vehicle...and then takes a brick and breaks one of the windows. Barbara puts the car in the drive mode and is able to get it to go downhill. She gets out sees a farmhouse in the distance. When she gets there, she locks the door and picks up a knife for defense. Barbara appears to be the only one in the home. When she tries to use the phone, she discovers it is disconnected. The ghoul, now joined by others, is unable to get inside. Barbara goes up the stairs and discovers the decomposing corpse of an old woman. She screams and runs outside...directly into the glare of a truck's headlights. 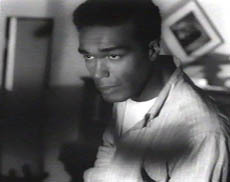 The driver is Ben (Duane Jones) and Barbara mistakes him for a ghoul until he whisks her back to safety. The truck is almost out of gas and after Ben sees the corpse in the house, he tells Barbara they must leave. Barbara is in shock and unable to speak at first. Finally, she demands to know what's going on. Before Ben can answer, he hears the sound of his headlights being smashed. He grabs a crowbar and knocks two of the ghouls on their heads. A third enters the house and Ben saves Barbara just in time. He drags the zombie's body outside and sets it on fire...as another group descends on them. Ben searches for tools to barricade the house and instructs Barbara to turn on all the lights. She's so rattled, she can barely do anything. In the living room, she becomes entranced by a music box. Ben does most of the boarding up himself and tells Barbara about his experiences earlier in the night...how he was trapped in a diner with "50 or 60 of those things" surrounding the place...and how he got into his truck and drove right through them. Barbara describes her story about Johnny and the cemetery. She becomes hysterical and is under the illusion that her brother is still alive. As she attempts to leave the house to find him, Ben stops her. Barbara smacks him. And Ben responds in a gentle fashion by punching her in the face, knocking her unconscious. Ben turns on the radio to listen to the reports. An announcer calls the carnage an "epidemic of mass murder being committed by a virtual army of unidentified assassins." It appears the mayhem is widespread, affecting large cities and small towns alike. The announcer warns people not to leave their homes for the time being. Ben makes a torch using a cloth wrapped around a bedpost - and drags a sofa chair outside. He sets it on fire and the ghouls react by stepping back away from the house. The radio coverage continues. We hear that the President has convened his cabinet and top scientists to try and contain the situation. Ben finds a rifle and ammunition in one of the closets. Barbara wakes up in time to hear the most horrific development so far: the murder victims show evidence of having been partially devoured by their killers. Barbara and Ben are not alone in the farmhouse. They're joined by Harry Cooper (Karl Hardman) and a guy name Tom (Keith Wayne) - who have been in the cellar with Harry's family and Tom's girlfriend all along. Ben is furious they didn't offer any help. The two men did not want to risk their own safety. As they argue about what section of the house is safest, more and more zombies appear. Tom brings his girl Judy (Judith Ridley) out of the basement...while Harry decides to go back down and bolts the door. 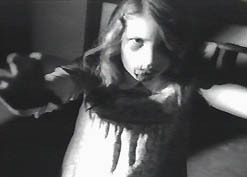 His wife Helen (Marilyn Eastman) is tending to their daughter Karen (Kyra Schon), who was hurt as they evaded the zombies. Helen is furious at Harry for keeping them isolated and away from the only radio in the house. She talks him into letting her go upstairs for a bit. Judy agrees to go back down into the basement and keep an eye on little Karen. Ben drags a TV into the living room and the group are able to watch a newscast. The anchor (Charles Craig) reports the latest: it appears the unburied dead are coming back to life. Survivors are to make their way to rescue stations set up around the country that are housing doctors and medical supplies. There is also a possible reason for the unfolding events. An explorer satellite that orbited the planet Venus...may have brought radiation back to Earth. As a precaution, a scientist tells viewers to make sure all dead bodies are cremated. Ben sends Helen back down to check on her daughter, while the men figure out a way to fill the truck with gas. They decide to keep the zombies at a distance by having Harry toss molotov cocktails from the second floor. The women are told to wait in the cellar but Judy refuses and rushes into the truck to join Tom. With Ben holding a torch in the bed of the pick-up, Tom drives to a nearby gas pump. However, gasoline is spilled and a fire is started. The truck explodes and Judy and Tom are killed. Their bodies are torn apart and then eaten by zombies. A large group of the undead encircle Ben but he is able to get back to the house. Harry is reluctant to help board up the front door but ends up giving Ben a hand. Harry's cowardice angers Ben...who knocks him around a couple of times and tells Harry he should have fed him to the ghouls. Later, Ben wonders why Karen is so sick and Helen says she was bitten after their car was overturned. 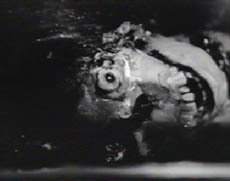 Another TV report instructs viewers to shoot at the heads of the undead - since the radiation has activated their brains. The electricity goes out...and the zombies outside are getting more aggressive. Wimpy Harry grabs the rifle and tries to get Helen to go down with him into the basement. Ben struggles for the weapon and ends up shooting Harry in the stomach. Harry makes it to the cellar and falls next to his daughter. Helen discovers the grisly spectacle of Karen eating her own father. Before Helen can react, Karen picks up a blunt object and stabs her. The walking dead have entered the house. Barbara is abducted and presumably killed. Ben goes into the cellar and sees Harry and Helen about to come back to life. He responds by shooting them both in the head. It's now morning. Sheriff McClelland (George Kosana) and a large posse arrive at the farm. Ben can hear the gunshots outside and figures it's safe to leave. As he approaches a window, one of the men mistakes Ben for a zombie and fires. Ben is shot between the eyes and the sheriff yells, "Good shot! Okay he's dead, lets go get him...that's another one for the fire!" Night of the Living Dead is basically an old-fashioned monster movie. The stark black and white photography adds to the bleakness and overall effect. The initial reviews in America were negative and the film had a modestly successful run. It became a sensation after it began playing as a midnight movie and word of mouth spread. 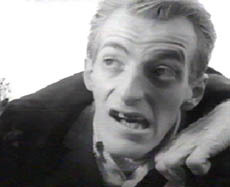 European critics were kinder, with the British publication Sight and Sound selecting Night of the Living Dead as one of the year's ten best. Pop references and homages to Night of the Living Dead appear frequently i.e. the quick shot of a Haddonfield resident in Halloween II napping as Michael borrows a knife...and as Living Dead plays on the TV in the background. Director George Romero's long and storied career in the genre began with this auspicious debut. Among his works are The Crazies (1973), the interesting vampire variation Martin (1977), Creepshow (1982) and Monkey Shines (1988). However, it's his zombie association that he is best known for. 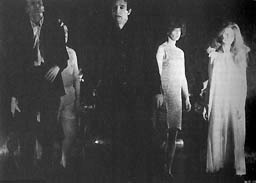 In 1979, he and Dario Argento brought forth Dawn of the Dead, an excellent sequel to Night of the Living Dead that many consider superior to the original. A second follow-up came in 1985 with Day of the Dead. All in all, there have been six "of the dead" films: the aforementioned three...and the abysmal Land of the Dead (2005), Diary of the Dead (2007) and Survival of the Dead (2009).